Non-profit NGO that does not apply for private donations or public subsidies. 1919 - 2019 - A century ago, the idea of a global minimum wage was mentioned as soon as the International Labor Organization (ILO) was created. But since then, projects calculated according to the median or living wage of each country have proved to be inapplicable. The "International Convention for a Global Minimum Wage" project proposes global, pragmatic and structuring economic solutions that could reduce both environmental damage and inequality. A reasonable global minimum wage, as we recommend it since 2014, with 5 to 7 levels of compatibility, initially sectoral, progressive and specific to exported production, could succeed and mark the beginning of a rich economic, ethical and philosophical reflection. Le Figaro/Tribune by Francis Journot, published april 11, 2019 - Francis Journot, initiator of the "International Convention for a Global Minimum Wage" project, publishes an open letter in favour of a "global minimum wage". He believes that it could reduce the damage that consumerism does to the environment. The European Commission's Directorate General for Employment and Social Affairs, which is in charge of replying to my recent letter, recalls the framework of the "European Foundation of Social Rights" proclaimed on 17 November 2017 in Gothenburg and the principle relating to wages, which mainly provides that "appropriate minimum wages must be guaranteed, at a level allowing the needs of workers and their families to be satisfied".... However, the Commission is well aware of the impossibility of establishing a European minimum wage within the current legal framework defined by the Treaties and regrets: "the competence to set wages and minimum wages lies mainly with the Member States" and "any proposal for a European framework for minimum wages should be approved by the Member States". So, if we add to this, the opposition of the likely future German Chancellor Annegret Kramp-Karrenbauer (AKK) to the model based on a percentage of the median salary, recently proposed by the French President Emmanuel Macron or by the EU previously, to which many Member States are also opposed, we can then consider that you currently have no effective solution in this matter and it seems urgent to change the method. The International Labour Organization (ILO) has been trying to establish a global minimum wage since its foundation in 1919 and the EU has been trying in Europe for 20 years. The UN denounces consumerism and the destruction of the environment. The World Bank, the IMF, the WTO and the World Economic Forum have expressed concern about rising inequality. It is therefore necessary to combine actions. However, international institutions and the EU are trapped in excessively cumbersome protocols and room for manoeuvre is limited. Examples include the ILO's tripartite structure or the principle of unanimity among EU members. So how do we implement it? In a globalised world, competition between low-cost countries is obviously global and we must therefore understand these issues as a whole. Wages in the EU cannot be increased unilaterally without risking affecting the economies of some of its member countries. But at a time when everyone regrets the damage that consumerism has done to the environment and the rise in inequality, States around the world could, as part of a global consensus, be inclined to take a step towards a more virtuous model together. To do this, we would have to propose a realistic timetable based on personalised studies. The positioning of the cursor on minimum wage targets that may appear unambitious but that few countries could therefore refuse, would certainly not be likely to instantly change the living conditions of the 300 million working poor who live with less than 1.7 euro ($2) per day (source ILO) or those who receive barely more. On the other hand, this increase in remuneration, which would, however, initially concern only a part of the sectors of activity and populations, would secure this change and would, above all, make it possible to finally set in motion a project for a global minimum wage that has been dormant for nearly a century. Without it, the European minimum wages, particularly in the consumer goods manufacturing industry, would prove complicated or even impossible. It would therefore be appropriate to create a more agile and private-law dedicated structure, capable of pooling will and skills, but duly mandated by the EU and international institutions to prepare the conditions that will then allow the signature of international agreements. A strategy based on both economic expertise and a relevant communication could promote the establishment of a global minimum wage with 5 to 7 levels of compatibility. In continuity with the work already carried out and the leads identified since 2013 in the framework of the "International Convention for a Global Minimum Wage" project, more than 200 researchers could carry out analyses of the economic parameters of each of the countries concerned. Among these, many recognized experts would work, already experienced in these issues and often belonging to our large global network which now includes nearly 4,000 economists (most of whom hold a PhD in economics). Their counterparts in the EU and international partner institutions could share data or collaborate more broadly on the basis of a common methodology. The roles of the ILO and the WTO (World Trade Organization) could prove decisive. Research departments at prestigious universities could enrich this content. The full reports would sometimes include several hundred pages of analysis per country and projections whose exclusively technical and non-partisan treatment and interpretation would guarantee their objectivity. These would then be used to draw up the fair schedules proposed to States. They should make it possible to limit as far as possible the risks of economic dysfunction and to contain inflation phenomena. The other essential aspect of our mission would be to explain this little-known and complex subject to as many people as possible. To be successful, the minimum wage must be perceived by all countries as an opportunity for social and economic progress, sometimes even as protection. For example, in Europe, Eastern European countries would understand that in the absence of new rules, the "new silk roads" could destroy their industries without lifting other distant populations out of poverty. Indeed, Chinese workers' wages have increased considerably, but Chinese industry now often uses labour located outside its borders and sometimes pays 40 euros ($50) for 200 hours a month. A wage increase for all workers working for export to major consumer markets could most often lead to an increase in the quality of manufacturing and materials used. This increase in value added, which would offset a decrease in export volumes, would also reduce consumerism. The means of communication and teaching deployed would include holding 100 to 200 conferences around the world in 2 to 3 years, providing real-time information on the progress of the project, increasing the number of forums in the international press and, more generally, using the most effective tools. At a time when we are all concerned about the future of humanity and the loss of biodiversity, the "global minimum wage" could rebalance economic mechanisms and thus reduce the ravages of consumerism on the environment. Le Figaro/Tribune by Francis Journot, published march 11, 2019 - While in his letter to Europeans, French President Emmanuel Macron advocated a "European minimum wage", Francis Journot believes that this proposal is inconceivable, and explains that it is only on a global scale that it is possible to imagine such a system. In his manifesto "for a European renaissance" published on 4 March in the 28 EU countries, the French President Emmanuel Macron advocated "a European minimum wage, adapted to each country and discussed collectively each year". 22 countries already have a minimum wage ranging from 260 to 2,000 euros, which does not always guarantee decent living conditions, and conventional minima in countries without a minimum wage sometimes provide their workers with acceptable incomes. The heterogeneity of wages within the EU is therefore undeniable. Yes, but the slogan "European minimum wage" which appeared in the 1990s to announce a new social Europe and which is now being recycled by Emmanuel Macron, is not a project in its own right. In a globalised world, it is essential to understand these issues as a whole. Competition between low-cost countries is global. Also, few countries would tolerate economic interference in the name of wage homogenisation in the EU, which could not only reduce their competitiveness towards and with their European neighbours but also increase their wage cost differential with more distant countries (for example Ethiopia with sometimes monthly wages of 40 euros for nearly 200 hours worked). On Saturday, March 9, the new CDU president Annegret Kramp-Karrenbauer (AKK), and perhaps future chancellor of a Germany that has many of its subcontractors in lower-cost eastern european countries, obviously expressed her disagreement. On the other hand, at a time when everyone is concerned about the rise in inequality and the damage consumerism is causing to the environment, States could, within the framework of a global consensus, advocated in the concept of the "International Convention for a Global Minimum Wage", be more inclined to take a step towards a more virtuous model together. After the First World War, the world minimum wage was one of the first projects of the ILO (International Labour Organisation), created in 1919 under the aegis of the Treaty of Versailles. Researchers most certainly quickly identified the most obvious ways at first glance, a global minimum wage based on a proportion of each country's median wage or income (50 or 60% often cited) and the living wage more or less close. These proposals have since been taken up by the defenders of the global minimum wage and by Emmanuel Macron today. But it can be assumed that ILO economists became aware of certain risks before the 1928 Convention. Indeed, the inclusion of a high or low median wage in the calculation of a local minimum wage does not guarantee that a State can then be able to cope in certain cases with an increase in the remuneration of its civil servants or that the inflation rate that could result from a generalisation of the minimum wage is contained and does not aggravate poverty situations. The danger of generating unrest and the bankruptcy of some states has certainly tempered the desire for social progress and encouraged caution. Also the Convention concerning the Creation of Minimum Wage-Fixing Machinery left it to the signatory States: "Each Member which ratifies this Convention shall be free to decide the nature and form of the minimum wage-fixing machinery, and the methods to be followed in its operation". 99 countries have ratified a convention that has not prevented inequality from growing. The global minimum wage has never seen the light of day. The International Convention for a Global Minimum Wage project was first published in 2013 and now benefits from a global network of 3000 economists who know the proposals. Among these are many researchers and professors from prestigious American universities (Harvard, Stanford, Yale, MIT, Columbia, Berkeley and many others) but also several hundred economists working in international institutions such as the UN, WTO, IMF or ILO. This project, which could be the only viable option for a global or European minimum wage, was sent on 19 February 2019 to the President of the European Commission Jean Claude Juncker. The proposal highlighted the difficulty of creating a European minimum wage outside a broader global minimum wage framework and suggested that the EU should take part in achieving this ambitious objective alongside international institutions. President Juncker has instructed the Commission's Director General for Employment and Social Affairs, Mr Joost Korte, to study the points raised. This measured concept with several levels of compatibility, offering a secure progressiveness and based on multiple parameters, would considerably reduce the risks of economic dysfunctions that could be feared when setting up a minimum wage. The theme of the European minimum wage advocated by Emmanuel Macron is certainly intended above all to attract voters concerned about social progress, but it is not certain that the choice of a minimum wage model that has proved impossible to implement for nearly a century is the right one. In December 2018, COP 24 was expected to finalize the 2015 Paris agreements, but judging by the absence of most of the 138 heads of state and government who were awaited and a disappointing result, we can only observe mistrust towards the climate strategy. But do the Paris agreements still make sense when they are ignored by the world's leading power and trampled underfoot by the second, obsessed with maintaining high growth and above all eager for industrial opportunities such as electric batteries, solar panels and wind turbines, for which it now holds monopolies? The other countries are not virtuous either. Germany, the largest economy in the EU, like many other countries, continues to invest in the coal sector, which accounts for 44% of global greenhouse gas emissions. This industry took the opportunity to do its green washing and the conference was sponsored by the Polish JSW, Europe's leading coal producer. The textile industry also wanted to improve its image because it ranks second among the most polluting industries behind the oil industry and has contributed, since the advent of fast fashion, to hundreds of ecological disasters. Every year, it releases 500 000 tonnes of microfibres into the oceans and still uses working conditions close to slavery with monthly wages sometimes below $60 or $120. Represented by 43 fashion groups, it has signed a charter to reduce its GHG emissions by 2050. However, the number of clothes and accessories manufactured has doubled in 15 years to reach 100 billion items per year and 10% of CO2 emissions. These figures could double again over the next 20 or 30 years according to the UN Environment: "If nothing changes, by 2050 the fashion industry will use up a quarter of the world's carbon budget". The high number of climate septic countries and the economic influence of many of them, make these world summits irremediably doomed to failure. The very title of the Climate Conference, which presupposes anthropogenic origin, and the content of the Paris Agreements, which focus on global warming, are counterproductive. They neglect the divisions and relegate the issue of other environmental problems which could more easily federate, to the background. The IPCC's alarmist report did not reduce the camp of scepticism and UN Secretary General Antonio Guterres had to extend the last COP by 28 hours to obtain some non-binding commitments. The divide will not disappear at the next COP and perhaps it is also necessary to break with an ideological and manichean vision that encourages a "North-South" opposition. The industry developed mainly from the beginning of the 20th century, but the damage caused to the environment has been mainly over the last four or five decades. Also, some States consider that in a context of permanent economic war exacerbated by the globalization promoted by the GATT (General Agreement on Tariffs and trade) and then the WTO, it is inconsistent to reproach them now for having followed this economic model which, 40 years ago, was also favoured by emerging or developing countries, even if some then benefited much more than others. At the end of the Tokyo Round in 1979, 102 signatory countries joined this choice of society that promoted growth and promised prosperity. The agreements then covered 300 billion dollars of trade instead of 40 billion in the previous round. Admittedly, everyone legitimately wanted development and poverty reduction for their country, but the risk of disastrous consequences, including the destruction of the environment, biodiversity and an increase in CO2 emissions, was already known. 60 other States joined them over the following decades. It is not surprising that the developed countries of the North, now judged by the Paris agreements, which are responsible for global warming and must therefore finance the energy transition of the countries of the South to the tune of 100 billion dollars per year from 2020, are not rushing to these global meetings or reluctant to write cheques, especially since a significant proportion of them do not feel responsible for the climate. It would be more consensual to rename the COP. A less ideological content that no longer confuses the various subjects, with new proposals and new insights into the less cleaved and concrete themes of demographic risk, environmental devastation and species extinction that no one can dispute, would make these conferences more credible and make it possible to combat GHG emissions more effectively. Energy transition and electric cars: sustainable solutions or illusion? It is regrettable that political parties and ecology NGOs have taken up the theme of global warming as their main focus and as a tool to influence domestic policies. This one now phagocytes the environmental debate. The Proposals that seem to be driven more by political ideology than by an interest in humanity often appear unrealistic. They are far from unanimous when they demand ever more energy taxes against consumers and businesses. The speech advocates the closure of fossil fuel power plants, but also in some countries of nuclear power plants that provide low-carbon electricity. But do we now have the necessary tools for a transition? Fossil fuels are polluting and nuclear waste difficult to store, but solar and wind energy can currently only provide complementary solutions in developed countries, given their intermittent nature. However, the gradual adoption of this economic model, whose relevance has never been demonstrated, could lead to a significant increase in energy prices. It is also worth being cautious about the global ecological gain that could be achieved by apparently cleaner cars but whose electricity would in fact often come from coal, fuel oil or gas in neighboring countries or not. Emissions would decrease in metropolitan areas of countries with nuclear power plants, but pollution crosses borders. We can also fear the ecological risk of an anticipated replacement in a few years, of a large part of a fleet of nearly a billion cars in working order, with regard to the extraction of the necessary raw materials, the GHG emissions that would be generated by the production of billions of tons of materials, the management of car waste and new electric batteries that we do not yet know how to recycle and a ballet of container carriers that would also contribute to environmental pollution. The arrival on the market of tens of millions of additional cars per year, often subsequently exported (currently 4 to 5 million European vehicles are exported to Africa each year), would contribute to the suffocation of new cities. The carbon tax, which is based on the polluter pays principle (PPP) that appeared in 1972, is proving inefficient. International groups often manage to avoid it and, above all, it increases the burden on local businesses and consumers in 21 countries, 17 of which are located in Europe, without reducing consumerism. In France, the "yellow vests" revolt began following a planned annual increase of €3.7 billion in fuel taxes presented to finance the energy transition. But of the 37.7 billion euros that were to be collected in 2019 under TICPE (domestic consumption tax on energy products), 7.2 billion euros or only 19.1% was allocated to the transition. It is not surprising that motorists who are already struggling to pay for food and vital energy rise up when the government wants to force them into debt for electric cars or new boilers. The environment pays a heavy price for every item produced and it is easy to imagine, given the demographics, that the resources of our planet will quickly run out. If we take a simple T-shirt, the carbon footprint is about 10 kilos from production to destruction, growing cotton can require 3,000 liters (792.5 gallons) of water and its journey can reach several tens of thousands of miles. In the field of metals, "99.9% of theoretical resources will remain untapped" according to physicists Robert Underwood Ayres and Brian Skinner (MIT). The rapid decline in reserves over the past 50 years, the criticality or predicted scarcity in the coming years and decades of some 20 rare and precious metals now essential to the exponential production of the electronics industry, may give rise to fears of a future impact on a highly digitalized and increasingly automated global economy. The economist and mathematician Nicholas Georgescu-Roegen warned as early as 1979 "It is an illusion of linear thinking, modern mythology of progress and development to believe this abundance without ecological consequences and without limits." Shortages would upset our daily lives and could cause chaos much faster than global warming. States, populations and companies would suffer the effects of repeated financial crashes and conflicts would increase. We must save our reserves to delay this damage, but perhaps we will escape a future of science fiction, dehumanized and populated by machines. Nothing seems to be able to moderate over-consumption. Climate marches and petitions, which, although mediatized, only mobilize a tiny part of the population. They have no influence on a deregulated free trade model that favors low-cost production and an imposed offer to which consumers generally comply. The carbon tax is rejected by most countries. A reintroduction of tariff or non-tariff barriers is unlikely in the short term, considering the supply chains of products often made in the world and the possible sudden drops in growth that would destabilize the economies of many countries. As for the COP, they have failed for 40 years. So are we at a dead end? However, in order to reduce the damage, it is imperative that we think of pragmatic economic solutions that are quickly operational and, above all, capable of bringing people together. In a globalized economy, the solutions are mainly global and downstream taxation has shown its limits. In order to reduce our consumption of disposable or obsolete products, we could use economic mechanisms upstream of production that could guide industrial companies towards a revaluation of their production. If we choose the example of fashion, when the labor cost is insignificant, the materials used are often of poor quality. These low-cost products, resold as low and mid-range but sometimes high-end, first offered with a high coefficient, are often then sold off or commonly destroyed. An increase in the wage cost could generate a new look, a valuation of products and a decline in the disposable. Consequently, a global minimum wage offering 5 to 7 levels of compatibility with the economies of the countries concerned, initially sectorial, progressive and specific to production mainly intended for export to the USA and the EU, would generate an overall increase in the quality of articles and recreate balances without having a serious impact on the prices paid by Western consumers, if we consider also that it is not uncommon for an article to be sold 10 or 20 times its ex-works cost price and that unbridled competition in the consumer goods manufacturing industry would regulate prices. Given a rise in wages that would only concern a portion of the population and an increase in the value added of products that could offset a decrease in volumes, the nature and growth structure of producing countries would change more or less according to the sectors of activity occupied, but states should not deplore sudden economic upheavals. The International Convention for a Global Minimum Wage project, launched in 2014, benefits from a global network of 2,300 economists who know the proposals. Among these are many researchers and professors who teach at American Ivy League universities (Harvard, Yale, Columbia, Cornell...) or Stanford, Berkeley, MIT and other prestigious schools but also economists working in international institutions such as the UN, WTO, World Bank, IMF, World Economic Forum or ILO.The global minimum wage could mark the beginning of a new and rich economic reflection if it is also ethical and philosophical. This could be a point of convergence between the WTO, which is engaged in a free trade policy but more aware than ever of its perverse effects at a time when calls for a paradigm shift are increasing, and the UN, which is seeking solutions that can slow the damage caused to the planet and reduce inequalities. Le Figaro/Tribune by Francis Journot, published october 31, 2018 - The latest UN environmental report recommends that governments change their economic models and you sound the alarm bell: "If we do not change course by 2020, we risk missing the point where we can avoid runaway climate change, with disastrous consequences for people and all the natural systems that sustain us". However, it is important to be realistic. Heads of state want more growth, companies do not like constraints and consumers do not change their habits much. From the first COP co-organized by the UN in Geneva in 1979 to the Paris Agreements in 2015, environmental policies have been ineffective. Admittedly, the polluter-pays principle that appeared in 1972 may seem justified, but the punitive ecology that systematically recommends taxation cannot constitute a relevant environmental policy and can only divide nations, especially since its application is uneven and disordered. The acceleration of environmental degradation is one of the consequences of the deregulation of world trade promoted by international organizations that now promise apocalypse. We need to break the ideological deadlock. After 23 COP It is time to draw conclusions and take a new look. Only a fair policy could be understood. In a globalized world, solutions must sometimes be global. "The low-cost economy favours consumerism and is an ecological, economic and humanitarian anomaly"
To restore a more qualitative and sustainable consumption, we must therefore intervene upstream on the economic mechanisms that generate this situation. Adjustments could make it possible to initiate a new business model naturally and flexibly. One of our many tasks would be to find a balance between the different imperatives. We would then have to determine the most appropriate global minimum wage level for each of the 5 to 7 categories that would include all the countries concerned, sometimes with delayed progress. The amount set, which would only concern workers producing goods and services for export to the United States and the EU in the first few years, should be high enough to reduce poverty without causing economic disruption. A reasonable level would gradually influence the disposable culture. This work, although we have already made estimates, would require several hundred comprehensive studies and country-specific consultations. It would be complex and considerable but essential because it would secure the paradigm shift and guarantee States and companies, but also consumers, a gradual transition under the best conditions. All relevant economic and social parameters should be taken into account and the various scenarios objectively considered. A large part of the analyses and preparatory work would be carried out within a dedicated structure located in Europe and the USA. Based on a common methodology, economic studies and projections would be carried out by university economic research departments that would like to be involved in this historical project. In order to complete our work in less than two years, we could also use several international specialized firms and recognized associations of economists. In addition, as soon as the first measures are applied, an internal observatory would analyze developments. Subsequently, in the light of a new economic and philosophical reading, other solutions complementary and comparable to that of the global minimum wage would emerge. Our world could thus gradually and positively transform itself. We would probably consume less but better. In the long term, artisanal or local production could more often compete with less sustainable industrial products and tens of millions of families could make a living from them. The question of overcrowding would find answers because the world minimum wage would promote the education of children, the emancipation of women and thus a reduction in birth rates. It is regrettable that the ILO has never succeeded in a century in establishing a global minimum wage that would certainly have moderated over-consumption and environmental damage during the proliferation of free trade agreements and the abolition of import quotas. Also, for the past 5 years, many people around the world have been following the evolution of the International Convention for a Global Minimum Wage project. American academics have expressed interest since the first publications. Today our network already includes more than a thousand economists, researchers and professors in economics often from prestigious universities in the United States and most of whom seem to be in favour of the project or at least a reflection on our proposals. The low-cost economy is an ecological, economic and humanitarian anomaly. The history and our children will certainly condemn us for these crimes against environment and humans. The dogmatic rhetoric of competitiveness often used, is inspired by some economic arguments already used two centuries ago by proponents of the slave trade and slavery, to protect their incomes in the production of sugar, cotton and other consumer products. Exacerbated neoliberalism is reaching its limits. Can we seriously want more free trade, and at the same time affirm that we are fighting to preserve the environment?​ In 2014, a NASA study evoked a possible end of our industrial civilization in a few decades. Everyone and even the financial markets are aware that a paradigm shift will have to be considered sooner or later. But most mainstream medias, doesn't seem ready to question old ideologies. will the editorial positioning of the new publisher of one of the world's most influential newspapers be different? You probably know the "International Convention for a Global Minimum Wage" project, like several thousand informed economists and journalists, politicians, managers of major companies or NGO leaders around the world. Reasonable and workable, it has already been published several times in the press including in the oldest and most prestigious French newspaper liberal Le Figaro. According to a study sponsored by NASA's Goddard Space Flight Center relayed by the british daily newspaper The Guardian on March 14, 2014, "The unsustainable resource exploitation and the increasingly unequal wealth distribution" could cause the collapse of our industrial civilization in a few decades. Our proposals are mainly oriented on these two axes : a progressive increase in the wages of workers producing goods and services for export to Western markets, by groups of economically close countries. Under this impetus, other local wages would mechanically increase over the years and the macro-economic effect would reduce poverty. This could make it possible to change, in the short or medium term, the lives of tens of millions of children, woman an men working in conditions akin to slavery. A pay increase and less quantitative production would reduce consumerism and slow down the destruction of the environment. Because it is a reality that no entrepreneur in the world is unaware of: in front of each wage increase, it is necessary, unless one wants to initiate a new collectivist model, that there is the corresponding financial resource and if we take the example of the H&M and Zara chains, whose 13,000 gigantic stores occupy several tens of millions of square meters that disfigure the most beautiful avenues in the world, this one exists. The two groups invest each year in the opening of 1,000 new stores. By reducing a little these or dividends or increasing the selling price of each article by only a few cents, tens of cents or 1 or 2 dollars/euros on more expensive coins, it would be quite possible to pay each worker several hundred dollars a month and the same is true in most industrial sectors. The latter’s impact is essentially on the tail end of the chain: the budget of drivers who want little more than to be able to go to work; moderate-income households that consume the disposable – and endlessly renewed – products that globalization pours into their shopping basket; fuel bills for people who can’t always afford to heat their homes properly in winter; and the bottom line of the last manufacturers in developed nations, who will wind up relocating production of consumer goods to countries that don’t apply a carbon tax… thereby increasing the emission of carbon and other toxic gases due to transportation. Piling on taxes and ineffective environmental regulations, avoiding global economic considerations and attempting to arbitrate responsibilities and duties for each country according to criteria that are more dogmatic than pragmatic displays profound cynicism and may seem like a kind of fiscal racketeering… more importantly, they do not a real, effective environmental policy make. In virtue of the principle of legitimacy and a hierarchy of priorities, the International Convention for a Global Minimum Wage – which could also have been named the International Convention for Human Dignity and the Preservation of the Planet, would override international business and free-trade treaties. Organized under the aegis of the two largest consumer markets (the USA and the EU), it would, in order to ensure its efficiency, be independent of existent bodies. If one considers the failure of the 1928 convention and other attempts, the International Labor Organization (ILO) has not, over the past 90 years, shown a capacity for introducing and successfully implementing a global minimum-wage project. Currently, many nations close their eyes to working conditions, believing they are serving their national interest, but those improper salaries actually keep whole populations in poverty and whole countries under-developed. Le Figaro/Tribune - Francis Journot denounces the slavery of several tens of millions of women and men paid a few tens or a little over a hundred euros a month. It defends a global minimum wage, which would initiate a transition towards a paradigm shift. Deregulation of trade and economic imbalances, overproduction and destruction of the environment, working conditions close to slavery and immigration, unemployment and precariousness in developed countries: the Happy globalisation and European cohesion have remained a slogan. On 17 November 2017, at the European Social Summit in Göteborg, French President Emmanuel Macron exhumed the theme of the European minimum wage without, nevertheless, integrating the parameters inherent in a globalised economy. However, the introduction of a European minimum wage could be achieved through the joint introduction of a global minimum wage. The export specific wage is an option that should now be considered. How to create a European minimum wage? The project of a single European minimum wage or according to the median income of each country never came to fruition when the EU had only 15 members and 25 years after Maastricht, one can doubt a possible agreement between the 28 countries. 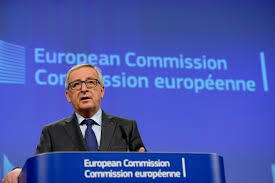 A salary that states could hardly assume in their administrations or that companies producing for the local population could hardly pay to their employees, obviously has no chance to succeed even in two stages, euro zone then EU, as recommended by the president of the European Commission Jean Claude Juncker. Moreover, a unilateral increase in European wages would deindustrialize and further impoverish a European Union which deplores an external deficit of $170 billion with China, comparable to that of the USA which exceeded 478 billion dollars in 2016 with the same country. Within the EU countries, only Germany is doing well. This one wins the jackpot with a world record surplus of $293 billion including 257 with China. The EU's largest economy benefits both from an undervalued Yuan that allows it to import parts at low prices and from a workforce of subcontractors from neighboring countries whose wages are among the lowest in Europe. European countries with the lowest wages in the EU will not give up their competitive advantage unless they are assured that the increase will have little effect on their respective economies. But for this to happen, it would then be essential that all the other low-cost countries also increase the competing wages of workers and employees producing goods and services that are then exported to the major consumer markets. It would therefore be appropriate to make exports to the two major consumer markets (EU and USA) subject to the commitment of the heads of state, during an international convention for a minimum wage, to then legislate in their respective countries, in favour of the world minimum wage for workers and employees who produce goods and services destined for the USA and the EU. Its amount, which could be between €250 and 350 in the first years, would be determined at the end of a vote of the convention. Certainly a share of Chinese manufacturing wages is already in this range but the workers working for the subcontractors more and more numerous in Asia, Africa or Europe (outside the EU countries) would benefit from it. Ambitious for some, too modest for others, this step would nevertheless constitute undeniable social progress for several tens of millions of women and men paid a few tens or a little over a hundred euros a month to work sometimes in conditions close to slavery. Similarly, the creation within the EU of a European minimum wage which could be around €600 would accelerate the achievement of the social Europe desired by Brussels but which has so far failed. The wage increase would satisfy workers in the 10 EU countries whose minimum wage is close to or less than €400 without threatening state economies. Indeed, it is unlikely that labour industries now relocated to lower-cost countries will return instantly to countries that have lost their know-how and productive capacities. For example, the manufacture of low- or mid-range textile articles would usually only cost a few cents or tens of cents more. On the other hand, the increase in the purchasing power of employees in industry and exported services would mechanically extend to all the populations of the countries concerned and could generate markets with higher added value, sometimes more local and respectful of the environment. When a worker paid monthly €30 or €100, assembles several hundreds or thousands of garments each month, the manufacturing cost is often considered insignificant but the same is not true for the impact on the environment because textiles are the second cause of pollution behind the oil industry. By instituting a minimum wage, clothing will gradually abandon its status as a disposable product. A salary of €300 would not necessarily increase prices in the big chains. These are generally set according to the purchasing power of consumer countries and their competition. The main impact would be the weekly rhythm of the "fast fashion" collections, the advertising budgets, the surface of the pharaonic stores installed on the most prestigious avenues and the profit margins. Previously each item had a manufacturing cost that valued the product. Now H&M burns 12 tons of clothes every year, according to Danish journalists. The unbridled free trade model that favours more quantitative than qualitative production and moves hundreds of millions of tonnes of goods from one end of the earth to the other will have to be rethought. According to The Gardian, the 15 largest container ships pollute as much as the entire global fleet. Today, nearly 100,000 cargo ships sail the seas. The climate conference held in Paris in 2015 made the world aware of climate issues but, like previous meetings, will not reduce overproduction, particularly in China. The world's biggest polluter had already failed the Copenhagen conference in 2009 and did not hide his ambition to dominate the world economy before thinking about reducing his emissions, the peak of which will not be reached until 2030, but judged the climate contribution of developed countries set at $100 billion per year from 2020, very insufficient. The failure seems inevitable once again. Of course, the global minimum wage would not solve all the problems. Nevertheless, it would initiate a transition towards an indispensable paradigm shift. Consuming less but better could be one of its objectives. This month we asked to a specialized group of reputable lawyers from the East Coast of the United States to forward our proposal for an international convention for a world minimum wage to the American government. 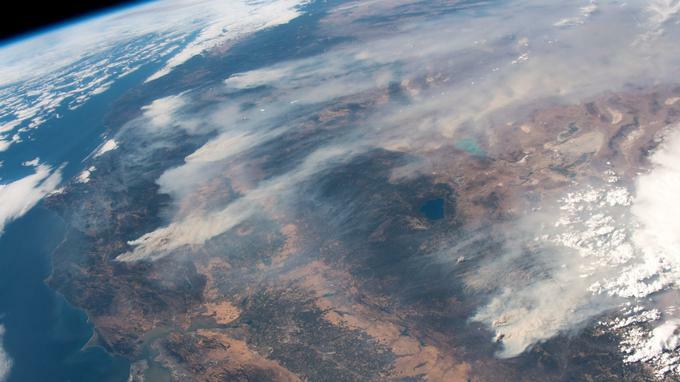 President Donald Trump could bring this project to fruition, which would represent important social and environmental progress for humanity, but will he want it? The idea of a global minimum wage is not new, but in the absence of a pragmatic project, the idea has never made any serious headway. The median salary according to the standard of living and average wages in each country is the most common suggestion, but putting a system like that into place would take decades. Indeed, in 1928, the last Convention concerning the Creation of Minimum Wage-Fixing Machinery, left tremendous leeway to each signatory nation, but the Convention was a failure: “Each Member which ratifies this Convention shall be free to decide the nature and form of the minimum wage-fixing machinery, and the methods to be followed in its operation.”99countries ratified the convention, including China in 1930 and India in 1955 – to little effect, as we now know. Other countries didn’t join until 2006 or 2007, some 80 years later. Thus this experience teaches us that, in order to be efficient and to be ratified quickly by the largest possible number of members, any new international convention must necessarily establish precise, common methods of application. In addition, the process must not be financially onerous for the member states. To begin with, the global minimum wage we advocate would be aimed at wage-earners whose work is related to products and services for export to the world’s largest consumer markets. The heads of developing states could see the advantages of a decent wage, which would also be a source of tax revenue and would contribute to development paid for, in part, by consumers, essentially in the West. In the long term, the minimum wage could generate a positive macroeconomic effect on the standard of living of entire populations. Currently, with hourly wages generally ranging from a few cents to less than half a euro, wages’ share in the production cost of consumer goods produced in low-wage countries often represents only 1 to 5% of the total price paid by the consumer. A specific global minimum wage of $300 to $400 would increase production costs, but should still have only a moderate impact on consumer prices. Between the effects of the global economic crisis – which has reduced purchasing power – and increased competition, with an endless stream of new players, particularly in the garment industry, supply generally adapts to demand, and price tags for low-end and middle-range consumer goods have been shrinking. The fact is that the large corporations that outsource labor to low-wage countries generally enjoy wide enough margins that they can reduce them without harming their own profits. Apple, for example, posted a total of nearly $80 billion profits in 2013 and 2014, and chains like ZARA and H&M have been opening some 400 new luxury megastores a year, in some of the world’s most desirable real estate. Integrating a living minimum wage and the actual environmental impact into production costs would guide us towards curbing consumerism and, long term, would help reduce global warming as well. Raising industrial wages in developing nations would reduce the productivity gap between industrial production and craftsmanship. That would encourage the growth of local cottage industries and farms that are more respectful of the environment, which could then guarantee vital revenue to independent craftspeople or employees of smaller-scale structures, particularly in developing nations. Production would gradually evolve towards a higher-quality, less-disposable offer with less planned obsolescence, which would subsequently be more economical for consumers. At a time when the economic model based on a headlong race for growth has revealed its limits, but continues nonetheless to contribute to the destruction of our planet, it is time to require asocial- and ecological-responsibility percentage from the world’s largest corporations. It could be calculated on the basis of the true environmental footprint of the services oritems sold. It would take into account the quality or solidity of the items, and the working conditions for those offering services directly or producing items for sub-contractors, as well as all stages of sales and delivery, including advertising. Through a global agency devoted to this process, their contribution could finance actions in favor of fighting global warming, particularly through developing local economies and cottage industries, or any other actions leading to reducing the corporations’ ecological footprint. The task would be less daunting that it might seem, because fewer than 400 international corporations share the quasi-totality of the global marketplace. It would be only right and fair that corporations which profit excessively from the world’s resources should contribute financially to repairing the damage they cause. In your World Day of Peace message communicated on 10 December 2014 entitled “No longer slaves, but brothers and sisters,” you drew attention to the “social responsibility of consumers” thus: “Every person ought to have the awareness that ‘purchasing is always a moral – and not simply an economic – act’”. It is true that consumers can and must reduce their consumerism. Yet responsibility also lies with the free-trade policies that encourage consumerism and which, in just a few years, have caused CO2 emissions to sky rocket. Purchasing used to be a considered act based on looking for the best value for money in a diverse, but relatively high-quality offer, but nowadays, the guidelines have disappeared. Consumers, ever more subject to an onslaught of advertising, consume whatever offer that is imposed upon them by a small number of multi-national corporations that reign over consumer markets. Individual consumers are now practically obliged to frequently renew disposable or soon-to-be-obsolescent equipment produced in low-wage countries where there is often little concern for either human rights or the environment. According to a 2012 UNICEF report, 322 million children (23% of 5-17 year olds worldwide are involved in economic activities. Among them, 215 million work in unacceptable conditions, and over 110 million of them are subject to unspeakably bad conditions. If one recognizes that when parents are paid a living wages children are less likely to be obliged to work and can instead pursue and education, then the existence of a living wage is crucial to children’s well-being. By the same token, we watch helplessly as thousands of migrant children and adults drown in their attempts to immigrate; they are often fleeing countries where the wages of those who produce items intended for the large consumer markets barely allow them to survive. We must work towards the regulation of a global labor market, which, in the entire history of humanity, has never involved so many people in slavery-like conditions in emerging and developing nations, or so many poor or unemployed people in developed ones. On 2 December 2014, International Day for the Abolition of Slavery, a meeting co-organized by the Vatican and the Global Freedom Network, initiated by the Australian millionaire and mining magnate Andrew Forrest, obtained the signatures of 16 major religious leaders who jointly pledged to work together to “end slavery by 2020.”Yet the declaration does not seem to have involved a joint strategy. Thus one can legitimately fears that, like so many conferences and conventions organized since the Universal Declaration of Human Rights in 1948, the resolutions will not have any concrete effects. In addition, the movement’s website, which, it was hoped, would attract the support of a major proportion of the world’s population, seems to be stagnating at about 11,000 signatures on Facebook and just over 2,400 on Twitter. Unfortunately, it seems that the hoped-for global mobilization has not fallen into place. Published in September 2013, the Global minimum wage to abolish slavery project has attracted attention from world-renowned economists; among them, several who teach at prestigious American universities have contacted us to express their interest. Although it is of a clearly different nature and never really came to fruition, as of January 2014, the American minimum wage project had gathered the support of 600 economists. The religious leaders who you brought together, as well as a great number of economists around the world, are among those who could support the “International Convention for Minimum Wage ”that we propose. Some of them could participate in it. Both developing and developed nations could see this convention as an opportunity to restore peace and stability to a world on the verge of social collapse. This would perhaps convince the USA and the EU –the two principal consumer markets, the International Labour Organization (ILO) and the World Trade Organization (WTO) to seriously consider the necessity and ineluctability of a global minimum wage. Letter to Barack OBAMA, president of United States of America, Jean Claude JUNCKER, president of European Commission, Robert AZEVEDO, director-general of WTO, Guy RYDER, director-general of ILO and all heads of state in emerging and developing countries. "The eradication of working conditions close to slavery begins with a decent wage"
The International Labour Organization (ILO) and many NGOs (non-governmental organizations) regularly attest to the alarming work and safety conditions for workers in low-wage countries. But the protocols signed by retailers and local industries have shown themselves to be insufficiently binding and have not significantly improved the lives of people who are too often reduced to slavery. Each year, hazardous health situations and accidents continue to kill thousands of workers. Unfortunately, it is unlikely that contractors will agree to give up even a minor share of their profits in order to advance workers’ safety. According to them, this responsibility belongs to the subcontractors, who generally argue that they are unable to fund improvements without the financial involvement of major retailers. Therefore, it is time to consider a different approach: better-paid workers with greater access to information, as well as to advice and legal assistance to protect and enforce their rights. If we, western consumer markets, agree to help employees in low-wage countries obtain a living wage for their work, we will also be providing them with tools that will allow them to improve their work, health and safety conditions. There is no doubt that they will know how to engage in a dialogue with their respective companies and countries that would lead to the eradication of living conditions akin to slavery. A convention against child labor was ratified by 174 countries in 1999. Yet 322 million children – representing 23% of the world’s population aged 5 to 17 – are engaged in economic activities. Of those, 215 million work in unacceptable conditions, and more than 110 million are subjected to extremely harsh working conditions. If parents were better paid, many children would not be obliged to work and could get an education. In the context of globalization, the situation of workers in developing countries must be approached with a global vision. One can always point the finger at the danger and risks in specific jobs and industries, or the extreme exploitation of workers in certain countries, but that exposes them to outsourcing production to other regions where workers may be even less well-protected. The 2013 Rana Plaza building collapse in Dhaka cost 1,133 people their lives and injured 1,900 more workers, of whom 1,000 women and men had serious injuries, often requiring amputation. Since then, several textile firms – probably more concerned with their own image than with the plight of Bangladeshi workers – have transferred production to other countries in Asia or Africa. 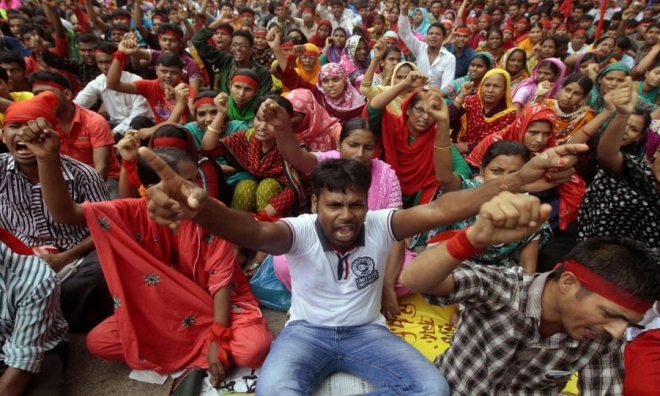 On September 12, 2013, an attempt to compensate the Rana Plaza victims was organized in Geneva under the auspices of the ILO. Only 9 out of the 29 brands involved bothered to attend. The absentees included AUCHAN, BENETTON, C & A, CARREFOUR, MANGO and the textile group INDITEX (with capital of almost €70 billion), which owns ZARA, MASSIMO DUTTY, BERSHKA, OYSHO, PULL & BEAR and STRADIVARIUS, among other brands. In order to put a stop to this insane and murderous cycle, perhaps it is time to try to come up with a more effective response. Most Western consumers would welcome the establishment of global wage standards. Nevertheless, the protection, rights, safety and health of citizens is the responsibility of each nation, which remains sovereign, even when there are clear lacks. Moreover, the immediate establishment of a living minimum wage for all employees in every developing country would, most often, be economically unfeasible. Therefore, to provide long-lasting solutions to urgent and often dangerous situations, the key is to organize an international convention at which a mandatory minimum wage specifically for export work could be agreed upon, so as to allow for exchange to take place in a more fair and peaceful world. The U.S.A. and the E.U. could, in collaboration with the ILO and within the framework of the World Trade Organization (WTO), invite all low-wage industrial countries to ratify an international convention. In essence, this agreement would make paying manufacturing and service personnel in accordance with negotiated international standards a pre-requisite for exporting to the world’s two largest consumer markets. It would be necessary to collaboratively determine a figure that is high enough to raise the salary of many workers around the world, but also reasonable and moderate enough to be agreed to bythe largest possible number of exporting countries. A discussion between the main consumer markets and the exporting countries group could be based on the following, which would, however, only be a first step towards broader wage standardization. - A minimum net monthly salary of $500 or €400 for workers producing goods or providing services for export mainly to the two largest consumer markets, the E.U and the U.S.A. This would concern countries in Asia, South America, Africa and Europe. European Union countries that do not have a legal minimum wage or where the minimum wage is below the recommended threshold should also comply with this rule in orderto export to other E.U, countries and to the U.S.A. It would then be up to each participating nation to create legislation requiring both domestic and foreign companies to respect the provisions governing remuneration of personnel working for export that were agreed to at the convention. On December 7th, 2013 in Bali, the WTO, with 157 ministers from Member States, signed a historic agreement liberalizing international exchanges. The agreement provides for a reduction of duties on exports from developing countries, and a simplification of customs procedures. Large corporations and financial markets may well turn out to be the main beneficiaries of this agreement. This time, the WTO, along with the ILO, could organize an international convention to defend enslaved populations. In addition, the reduction in customs expenses afforded by this agreement represents a decrease in costs to trans-national industrial groups, which could participate in financing a revaluation of remuneration for low-wage employees in developing and emerging nations. In just twenty years of globalization, fashion and luxury corporations, large retailers and brands have built huge financial empires. Each year they distribute tens of billions of euros to their shareholders at the expense of abused consumers and exploited workers. Thousands of exorbitant temples to consumerism now occupy millions of square meters on the most beautiful streets in the world. But at the other end of the assembly line, salaries rarely reach $200 a month, and are often less than $120. On average, Bangladeshi women are among the lowest-paid workers in the world: as little as $40 for up to 250/300 hours of labor. In Ethiopia, some workers receiving as little as $28 a month also reported that they were beaten by the foremen. Yet it would be perfectly possible to pay employees who produce goods for export correctly, in all industries, at no extra cost to the consumer. The decrease in profits would be in the vicinity of just 50 cents for most items, and only a few dollars for the most costly products. For example, the annual production of a Bangladeshi woman in the textile industry who is paid less than $600 a year contributes directly to revenues of up to $200,000 to $400,000 a year. These revenues come from consumer spending in large retail chains or low-, medium-, high-end and luxury shops. Similarly, the cost of labor for a smartphone rarely exceeds 2-5% of the sale price; for a pair of brand-name sneakers, it is between 1.5 and 3%; a luxury bag crafted in a few hours is sometimes sold for as much as $1,000 to $2,500. 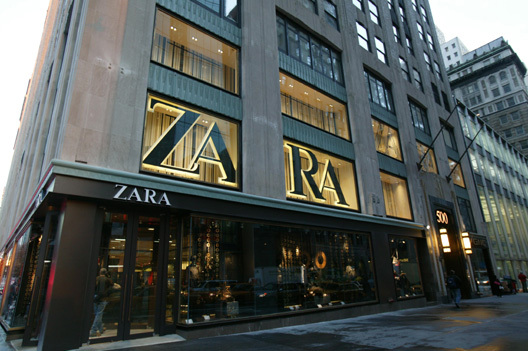 ZARA store on 5th Avenue in NY, occupies 32,292 ft2 (3,000 m2) and cost 324 million dollars. The Inditex group has 6,000 stores around the world. 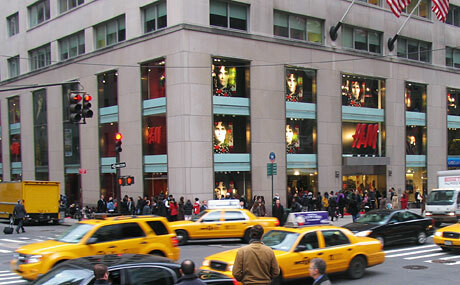 / H & M, which already has 2,853 stores worldwide, continues to open new ones apace: 57,049 ft2 (5,300 m2) in Times Square; 41,979 ft2 (3,900 m2) on 5th Avenue, and 62,431 ft2 (5,800 m2) in Herald Center opening in winter, 2014. Parts for handbags sold for hundreds of euros, or even €1,000, at Louis Vuitton boutiques (LVMH Group), come from low-wage countries like China and Romania. Product traceability, represented by a barcode that would be required for export to the E.U. and the U.S.A., could facilitate the implementation of labor laws in exporting countries. What’s more, production of every single item has a direct impact on the state of the planet and the depletion of natural resources. Perhaps now is the time to begin to fight against consumerism, global warming and the destruction of the ecosystem. A barcode would give every item an identity. It would indicate the name of the contractor, manufacturer and sub-contractors, the economic conditions of employees involved in production, compliance of the substances used and their ecological footprint. This could be the beginning of true global resource and trade management. Moreover, it would be an effective tool in the fight against counterfeiting. According to most Keynesian economists and those belonging to other schools of thought, raises, particularly in low wages, have a positive macro-economic effect on countries’ development. The practical effects are amplified all the more on the local economy in developing nations when their economies’ are based on agriculture, livestock and manufacturing consumer goods. Improving the wages of employees working for export would mechanically lead to raises in income for all other citizens in exporting countries. Eventually, the increased consumption of necessities, whether food or material goods, would generate growth in the domestic market . Moreover, this could help build more independent, healthier economies that would be less oriented toward sever-increasing production, with its often-disastrous attendant effects on the environment. We, Western consumers, no longer agree to be unwitting accomplices held hostage to speculative economic policies that impose working conditions akin to slavery on women, men and even children 10 years old or younger. The promise of happy globalization which would benevolently create decent jobs in poor countries while providing cheaper goods to rich ones has hardly come true: working conditions in developing countries have barely improved since the beginning of globalization; unemployment in Western countries has mushroomed, and the prices of most consumer goods have steadily increased. It now appears that shareholders of major corporations are in fact the main beneficiaries of this fool's bargain. Western contractors clearly share responsibility for this form of modern slavery with local industry. They must also sometimes deal with mafia-style organizations and corrupt officials or politicians. Therefore, the introduction of a statutory minimum wage for export would assist signatory countries in fighting against corruption, which deprives workers and citizens of the fruits of growth that should, by rights, be theirs. Governments could thus better fulfill their duty to protect their citizens. Membership in this international convention between consumer markets and developing countries could represent a historic opportunity for economic and social progress for each of the signatory nations. Minimum wages that exceed € 1,000 month net would continue to apply.Long-term, the idea would be to first consider aligning the minimum wage in the more-developed European nations with the French, British, Belgian, Irish, Dutch or Luxembourger minimum wage (ranging from €1,100 to 1,550), and eventually applying it to the entire European community.